Backyards Plus installs both Red and Buff flagstone. We are well-versed in flagstone installation techniques such as dry laid or as an overly on top of existing concrete. 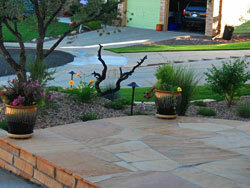 Backyards Plus installs flagstone to eliminate any chance of unwanted movement or cracking. We excel in designing and installing flagstone patios, flagstone pathways, flagstone walkways, flagstone walls, and flagstone steps.